Picture 1: This photo was taken in 1884 with Peak 8 in the background. Editor’s Note: This is part one of two about the story of two mines — the Washington and the Mountain Pride — that had very different stories and results during the latter parts of the 19th century and the early years of the 20th. The first part is the story of the Washington Mine, which had a very typical path from the gold rush days to the hardrock mining “boom” of the 1880s and finally to its ultimate demise by 1910 or so. Along the way, it had several owners, some who seemingly did logical and professional things that led to success and other owners that were just plain incompetent and consequently failed. At the Mountain Pride (part two), the owners seemingly did everything right, very professionally, enjoyed very adequate financing but failed miserably. Their stories are probably typical where fervent hopes and naked greed were either realized … or dashed. Part two will run next Sunday. The mine was a bit unusual for the area in that it was both a placer mine that sought nuggets and flakes of gold found in stream sediments and an underground, hardrock mine that produced silver, lead, zinc, and small amounts of gold — and did so simultaneously during some periods. Most mines were either one or the other type of mine but not both at the same time. It had several “heydays” of success — in the early 1860s as a part of the Pikes Peak gold rush, in the 1883 to 1886 period as primarily an underground, hardrock mine, and in the 1897 to 1903 period as a hardrock mine. Beginning in late 1859 (according to actual, original handwritten records) and over the next several years or so, prospectors staked individual claims near and within several stream drainages that eventually became the Washington property. The claims that included placer and lode mining claims, contained one named the Washington from which the entire property took is name. Individual prospectors/miners worked these claims intensively for gold nuggets and flakes in the streambeds through roughly 1862. Between about 1862 and 1870, many of these individually owned claims were either abandoned and re-claimed or were bought up by “consolidators” — miners or small groups of miners that consolidated individual claims into blocks of claims under one ownership and who may or may not have actually mined them. This was a very typical pattern of operation throughout the West at such a stage of development. In 1870, the “Fuller years” began. Thomas Fuller, a very astute and wealthy businessman from Boston, came to Breckenridge, saw its potential, and began to purchase consolidated groups of claims in several areas around Breckenridge, including what eventually became the Washington. By 1880, Fuller, essentially, a “consolidator of consolidators,” assembled dozens of both placer and lode claims, completed extensive exploration work to identify valuable mineralization, and, basically, consolidated most of the claims in his exploration efforts — an unusually sophisticated and expensive program for the times. Fuller also undertook a placer gold operation in Mayo Gulch — an operation that became one of the richest properties in Colorado at the time. He also started underground mining, mostly in an exploration effort to identify attractive target areas. While reliable records from this era are few, it appears that Fuller was well rewarded for his mining activities in Mayo Gulch and probably plowed his rewards back into further exploration and development work. Alas, in 1880, Fuller, seriously ill, sold his entire Washington operation to East Coast and London investors in exchange for a continuing ownership stake, and returned to Boston where he died in 1882. The investment group — of which Fuller retained an ownership interest, albeit a passive one — promptly launched a fairly naïve and inappropriate program. Even today, one of the basic tenets of the mining industry cautions not to invest money in infrastructure until economically viable ore is a certainty. 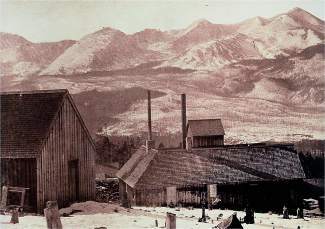 Instead the new owners — the Summit County Mining and Smelting Company — in 1880 immediately built a smelter in Breckenridge, a sawmill, offices, bunkhouses, a shaft house, and storerooms — all without a pound of ore in sight. Workers sank a major shaft — which eventually reached a depth of nearly 400 feet — in the quest for ore. After all of this expensive infrastructure and exploration effort, the company went bankrupt. On Jan. 9, 1883, assets of the company brought $673 in a sheriff’s sale on the steps of the county courthouse. At this point, the property became successful and an intriguing story emerges: Two of the three buyers of the property had been managers of their now-bankrupt predecessor company, had overseen all of the infrastructure and exploration work, and had even — in late 1882 — over-staked their own company’s claims with their own, all while employees of the bankrupt company. And — lo and behold — by June of 1883, the Washington began shipping ore. It seems like quite a coincidence that six months after their purchase of a bankrupt company with no ore in sight, the mine proved a success. Most reports from that time indicate a very successful operation — year-round production, a work force of over 30 men, large payrolls, shipments of ore, even expansion plans. The total mine property size reached its zenith at this point — about 277 acres, a fairly good-sized mining operation. A hint of future problems appeared in late 1885 when the mine changed to a seasonal basis and closed for the winter. In August of 1886, newspapers reported that the concentration mill and smelter closed and that the owners hoped to sell the property. In addition, it appears that one of the original partners might have died. The price of silver — one of the mine’s main money earners — continued its serious decline. There is little indication of activity at the mine from late 1886 until 1898 when new life appeared in the form of new owners. A geologist’s report from the late 1890s detailed extensive ore potential and recommended that the mine’s old dumps be “mined” since they held fairly large amounts of silver and lead. Much “milling ore,” ore of relatively low but still economic value, existed in the already developed underground workings. Furthermore, there were ore pockets and small mines on other parts of the Washington property that were leased out on a “percentage-of-production” basis to contract miners. Extensive activity continued until about 1905. The concentration mill, which had been located at the top of the Washington shaft, was moved much lower on the property. A new mine level — via the 1,400-foot-long Cornish Tunnel — connected with the older mine workings. A second new level fed ore into the new location of the concentration mill. In early 1905, a group of investors, the Joliet Mining and Milling Company, seeking capital for the newly prosperous property, issued a prospectus for the Washington. But more success at the Washington was not to be. A well-known federal government report issued in 1911 indicated that the Washington had closed, its workings caved in and inaccessible, as early as 1909. Scattered production here and there over the years and a fairly extensive professional analysis in the mid-1960s are all that remained of the Washington after about 1905. It is impossible to know how much profit actually came from the Washington. The late-1890s report cited earlier guestimates that roughly $400,000 to $500,000 of ore had been mined in late-1890s dollars, a considerable amount in today’s dollars. That amount increased somewhat due to production in the early 1900s. It is even more difficult to estimate the investment in the mine over the years. Suffice it to say, investors saw some return for their investments over the years but to be sure, it was small compared to the amount poured into mining operations — the story of probably many mines in the Breckenridge area. Rick Hague is a local mining historian and member of the Breckenridge Heritage Alliance and Summit Historical Society boards. This article is part of a book currently being written for the Summit Historical Society’s 50th anniversary. “Windows on the Past” by Sandie Mather is expected to be published in September or October 2016.